Complete Internet Repair, from Rizonesoft, is a utility that can repair problems with your Internet connection. Problems with an Internet connection can arise from corruption due to malware infection of a system. Complete Internet Repair does exactly what its title suggests, it attempts to repair everything internet related, including networking problems. 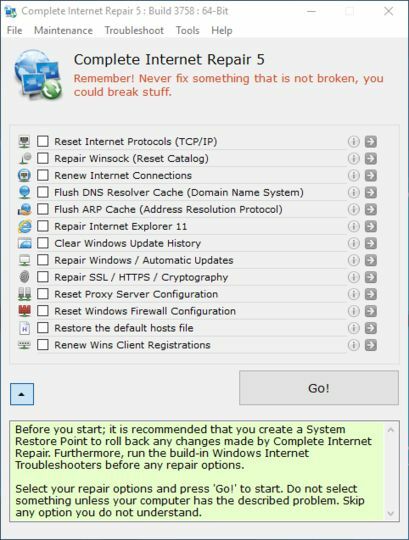 Internet or network problem after removing adware, spyware, virus, worm, Trojan horse, etc. Loss network connection after installing/uninstalling adware, spyware, antispam, vpn, firewall or other networking programs. Unable to access any webpage or can only access some webpages. Pop-up error window with network related problem description. No network connectivity due to registry errors. Fail to renew the network adapter?s IP address or other DHCP errors. Network connectivity issue with limited or no connections message. You are having problems connecting to secured websites (ex. Banking). Internet Explorer stopped working or crashes all the time. Of course, you should only run this utility if you are actually experiencing problems. It will not improve or optimize any working connection.